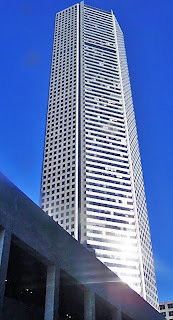 Of the three JPMorgan Chase Towers on my itinerary, the one at 600 Travis Street in Houston Texas is the tallest. The 75 story modernist skyscraper was designed by I. M. Pei & Partners and built in 1981. It is currently the tallest five-sided building in the world, at 1, 002 feet. 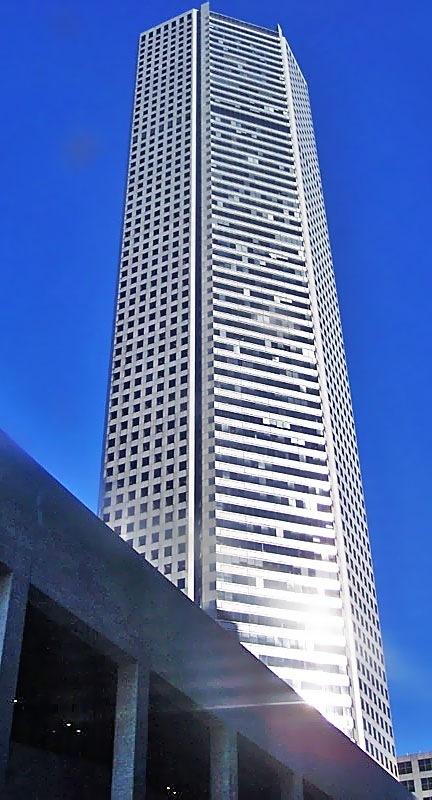 Prior to the construction of US Bank Tower in Los Angeles, this building was the tallest in the United States west of the Mississippi River. While the tower is currently named for JPMorgan Chase, the company only occupies a single space on the bottom floor. The tower is owned by Prime Asset Management and is still managed by its original owner, Hines Interests. Formerly known as the Texas Commerce Tower, the building was originally planned to be 80 floors high, but concern about interference with air traffic lead to its current height of 75 floors. Its lobby is composed of a 5 story atrium overlooking the plaza, which is home to Joan Miro’s Personage and Birds sculpture. The original model for the sculpture is displayed in the building’s 60th floor skylobby, which offers a free observation deck overlooking the city. The building also has an entrance to the Downtown Houston Tunnel System. Click here to see a list of the tallest building in each state.